Although satirical and political cartoons printed in newspapers and periodicals have been popular in England and America since the early 1800s, it is considered that the first comic book ever published was The Yellow Kid in McFadden’s Flats from 1897. However, it wasn’t until June 1938 that the Golden Age of Comic Books began, when Superman first debuted in Action Comics #1, followed by Batman who appeared less than a year later in Detective Comics #27. 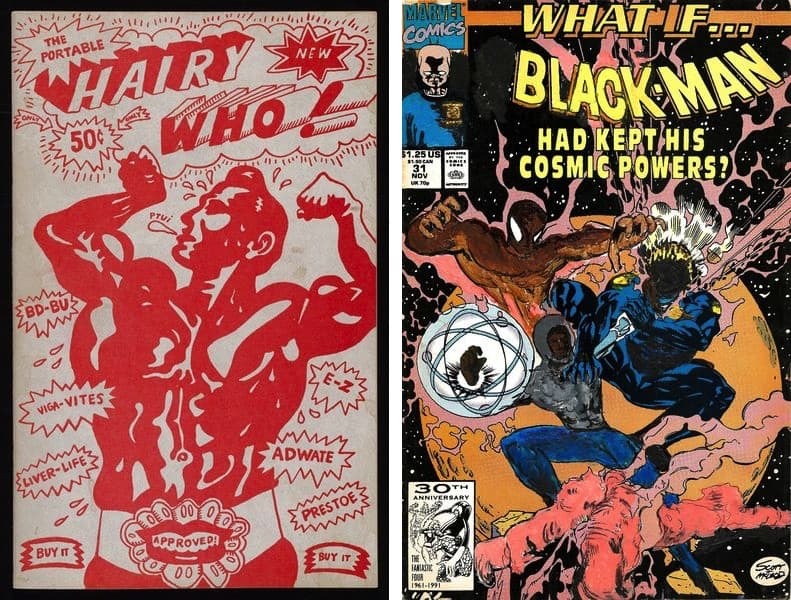 Over eighty years later, the comic book art and industry has remained as relevant as ever, crossing boundaries to enter other mediums. 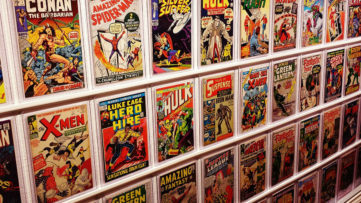 The Boca Raton Museum of Art will host a comprehensive exhibition dedicated to comic books, soaring beyond just superheroes. Titled Beyond the Cape! 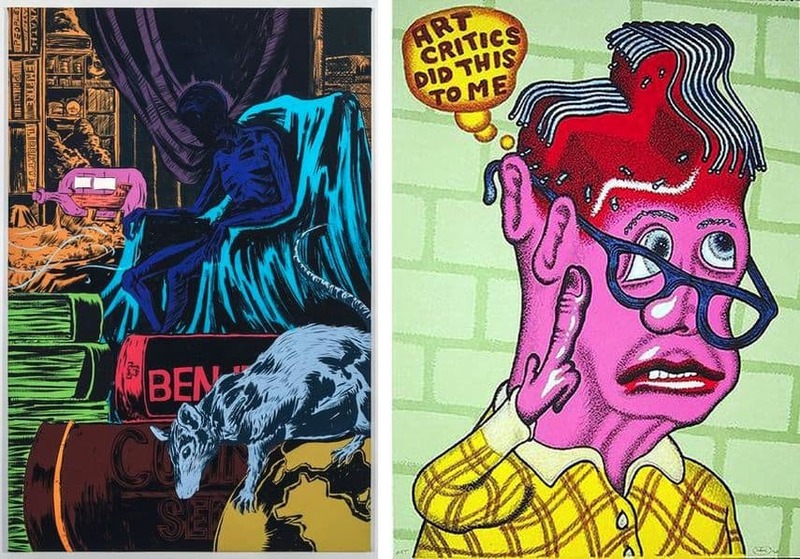 Comics and Contemporary Art, it will show how some of the most currently sought-after contemporary artists are influenced by graphic novels and comic books. The works on view will address a diverse range of issues such as politics, divisiveness, immigration, religion, racial prejudice, planetary climate armageddon, feminism, LGBTQ rights, and gender. Curated by Kathleen Goncharov, this comprehensive exhibition will bring together more than 80 works by 40 artists in a diverse range of media, including painting, video, photography, sculpture, prints, drawings, and tapestries. It will also present rare comics and a series of contemporary and historic animation works. Their work defies commonalities, but come together to present a boldly visual, eye-opening mirror of our contemporary world and present issues. The show will bring together prominent art world superstars such as Kerry James Marshall, who has been working on his comic series Rythm Mastr for the past 20 years, Takashi Murakami and Yoshitomo Nara, famous Japanese Manga artists, Elizabeth Murray, who began working with comic imagery in the 1970s, creating personal and colorful work, Peter Saul, known for his irreverent, idiosyncratic, colorful and political work, and Art Spiegelman and R. Crumb, alumni of the underground RAW comics. 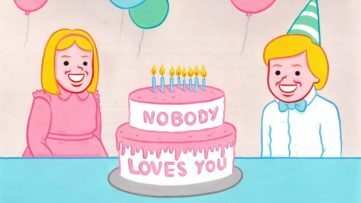 It will also include Kumasi J. Barnett, George Condo, Renee Cox, Liz Craft, Kota Ezawa, Chitra Ganesh, Mark Thomas Gibson, Trenton Doyle Hancock, Christian Marclay, Joyce Pensato, Raymond Pettibon, Kenny Scharf, William T. Wiley, David Wojnarowicz, Michael Zansky, Aline Kominsky-Crumb, Mimi Pond, as well as the artists from The Hairy Who, Gladys Nilsson, Jim Nutt, and Karl Wirsum. Beyond the Cape! will also present an extensive reading room designed by IKEA, featuring hundreds of graphic novels and comics for the public to enjoy. 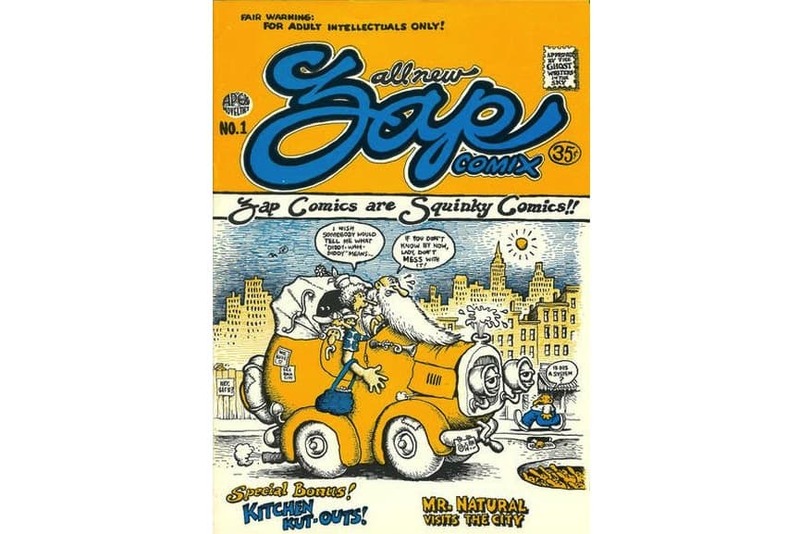 Selected by Calvin Reid, Senior News Editor at Publishers Weekly, the 200+ comic books and graphic novels includes works by artists such as Lynda Barry, Allison Bechdel, Roz Chast, R. Crumb, Aline-Kominsky Crumb, Mimi Pond, Trina Robbins, Art Spiegelman, George Takei and Ronald Wimberly, and many others. The exhibition Beyond the Cape! 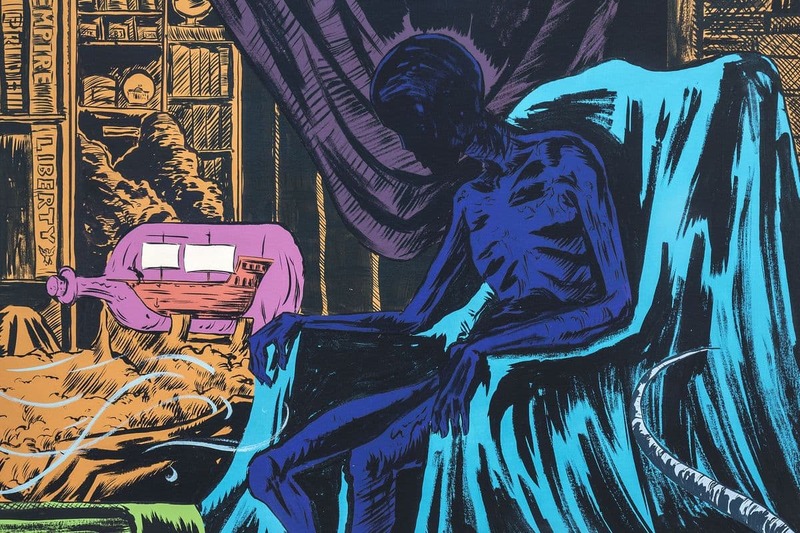 Comics and Contemporary Art will be on view at Boca Raton Museum of Art from April 16th until October 6th, 2019. 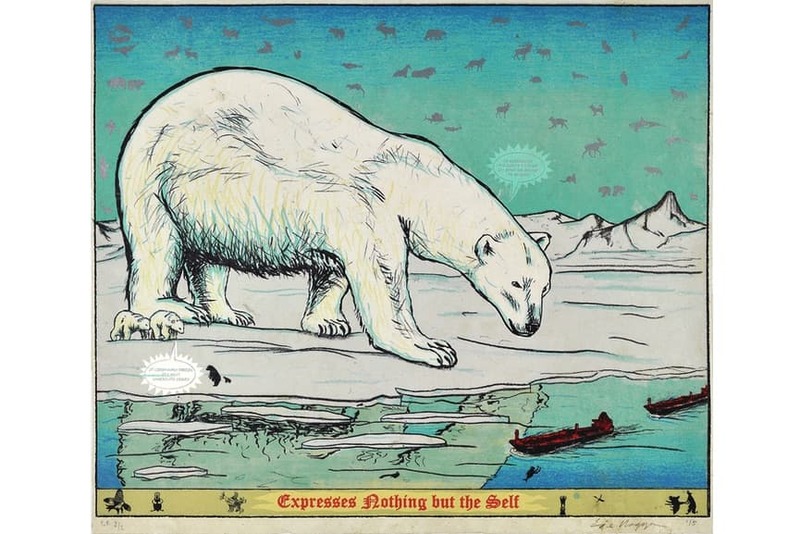 Featured image: Mark Thomas Gibson – Library (2) (detail), 2017; Enrique Chagoya – Express Nothing; R. Crumb – Zap Comix, No. 1, 1967. Collection of Beth DeWoody. All images courtesy of Boca Raton Museum of Art.